Excellent high performance coil for vehicles that have been converted from points to a breakerless electronic distributor or electronic ignition system, where a canister type oil filled can coil is preferred. Designed with optimized low resistance, high turns ratio windings to work specifically with ACCEL 41, 51, 52, 61 & 71000 Series breakerless electronic replacement distributors. Engineered for higher energy output resulting in quicker starting, improved throttle response and more high RPM power. Special crimped and soldered internal connections ensure positive contacts. High performance tan Alkyd tower provides "flashover" protection to primary terminals. Available in "ACCEL Yellow" or Chrome Plated can. 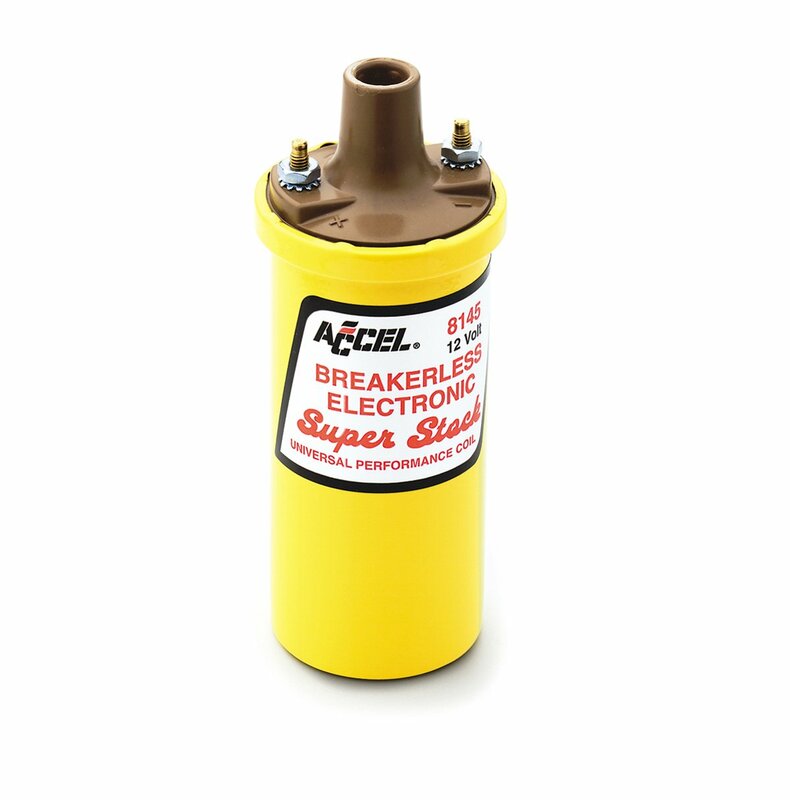 ACCEL's Super Stock coils are high-performance replacements for OE canister style coils. Improves starting, idle, throttle response and top RPM power. Works with OE ignitions and computers. Alkyd tower prevents flash over. 0.7 Ohms primary resistance.